Greek authorities have met with Tesla with discuss a collaboration. Greece is made up of thousands of islands, hundreds of them inhabited. That makes building a reliable electric grid in the European country a major challenge. But advanced energy storage and solar panel technology could make it a lot easier to ensure that every Greek citizen has a dependable source of energy — especially with the help of Elon Musk’s electric vehicle and infrastructure company Tesla, which has reportedly met with the Greek Minister of Environment and Energy George Stathakis to discuss ways Greece could use its Powerpack technology. Greece wouldn’t be the first island nation to benefit from Tesla’s tech. 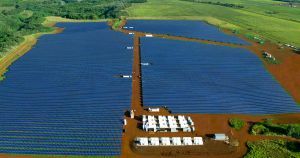 Tesla installed a Powerpack system on the island of Ta’u in American Samoa in 2016, and helped bring power back to Puerto Rico last year. In a statement issued to the Greek newspaper Capital, the Ministry of Environment said that a partnership with Tesla could “prove to be extremely beneficial” in creating “smart energy islands,” according to Google Translate. Tesla and the Greek government, according to Electrek, are planning to set up a pilot project on Limnos, the eighth largest island in Greece. They chose Limnos thanks to its relatively small size and low electricity demand in the summer, Greek energy portal Energy Pass reports. The idea is for a large solar farm to generate energy, which will be stored in a Tesla Powerpack facility. Moving away from non-renewable energy sources like diesel is a good thing. Besides, collecting solar energy in a sunny place like Greece is a no-brainer. Editor’s note Jan 15, 2019 at 9:50 PM ET: The subhead of this story has been updated to reflect that the pilot project has not started.